Step 1 Heat the oil in a medium skillet over medium heat and cook the onion until soft and translucent, 5 minutes. Add the butter and melt. Add the flour and cook, stirring constantly, 3 minutes. Add the stock, stirring constantly. If there are any lumps, you can use a whisk to help blend everything together. Raise the heat to high and bring to a boil. Reduce the heat to a simmer. Step 2 Season to taste with salt and pepper, then add the thyme and cook, stirring occasionally, until the sauce is thickened, about 5 minutes. Step 3Add the carrots and cook another 5 minutes. Add the turkey and peas. Heat through, then remove from the heat and keep warm. In Recipes-list.com we have selected the most viewed recipes from category - Leftovers Main courses . Enjoy the best recipes specially selected for you! 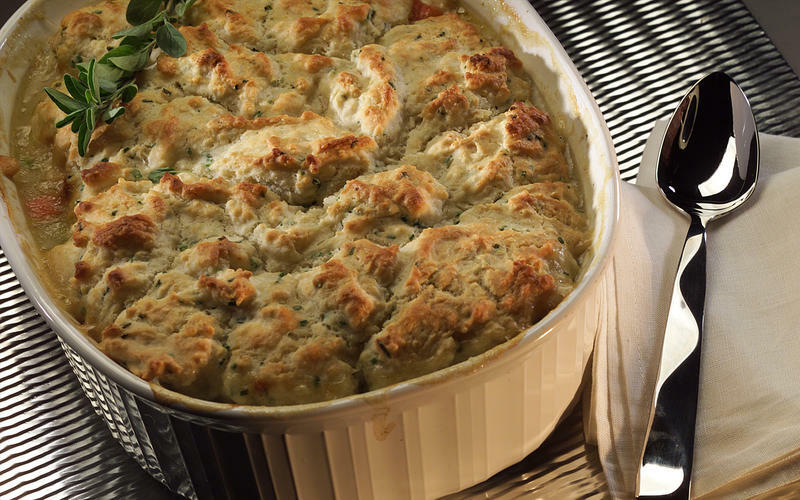 Turkey pot pie with biscuit crust is the right choice that will satisfy all your claims.